Well few days ago I came across a requirement where on button click user should be asked for confirmation about the action in a modal window. Well we don't have such component in Visualforce!. But hey! Wait! I guess the jquery has it! Why dont we use that one ? So started mixing Visualforce with Jquery and Result? A modal dialog box! Well Don get scared its very easy to implement! So created a package of the same and here is the link https://login.salesforce.com/packaging/installPackage.apexp?p0=04t900000009e5B. 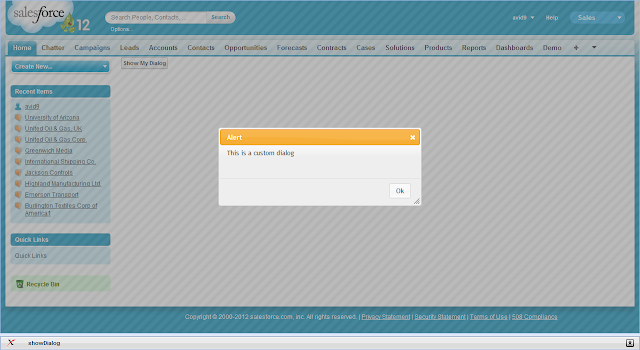 Just go to apex/showDialog page for demo and press the showDialog button. To summarize you can just open a modal window by just calling the openDialog method included in the showDialog page,make sure that you include necessary files while you implement the same in your VF page. Where the first argument is the dialog body and the second is the Dialog title.